This is often the time of year when a leaky heater core is first noticed. Coolant dripping from under the dash, steamy vapors drifting out of interior vents and slimy film on the windows are some of the signs. RockAuto.com is ready to help with new heater cores by ACDelco, APDI/PRO, Four Seasons, Motorcraft, OSC, Spectra Premium, TYC and more. 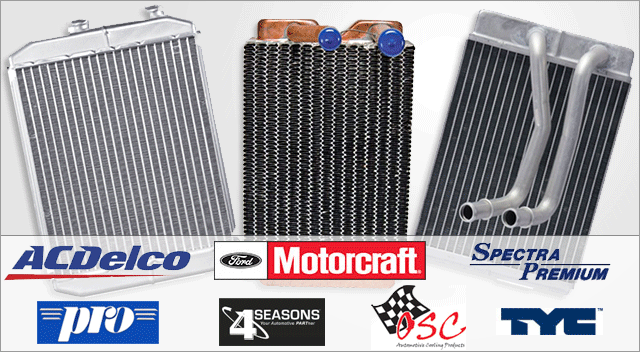 RockAuto.com has heater cores for daily drivers, classics and vehicles that are simply old - everything from a 2009 Acura RL, to a 2002 Hyundai Sonata, to a 1990 Ford Bronco, to a 1984 Volvo 760, to a 1962 Chevy Impala. Visit RockAuto.com and look under "Heat & Air Conditioning" to see the heater cores available for your specific cars and/or trucks.